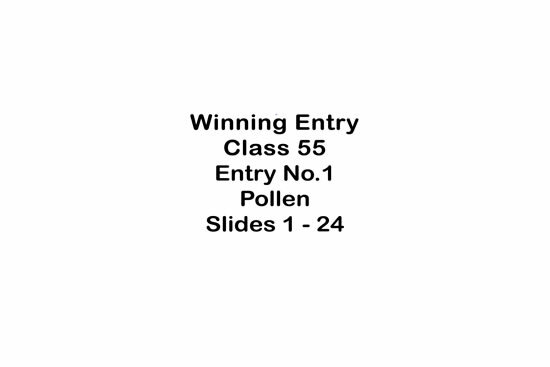 Winning entry for Class 55 - The subject for 2015 "Pollen" (24 images). Slide 1 - Pollen is a food source used by the honeybee as a valuable source of protein, pollen is also the male gamete of flowering plants and is required to be transferred to the female parts of plants so that pollination and hence reproduction, can take place. 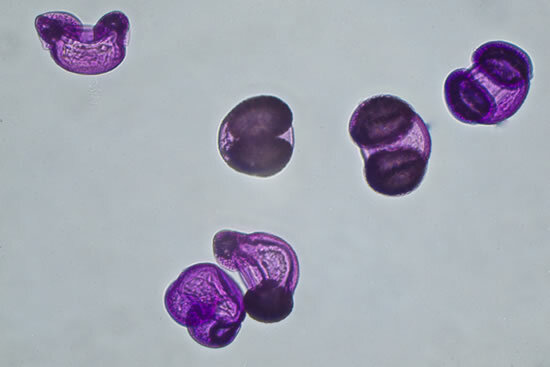 Slide 2 - Pollen comes in many forms, shapes and sizes. 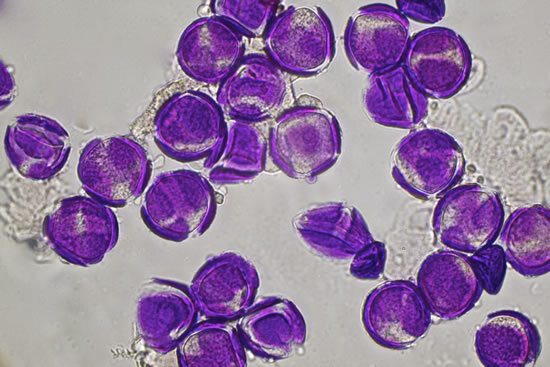 Some smaller pollen grains are carried by the wind and some by insects. Here we see pollen grains falling from a hazel catkin into the airstream, honeybees can forage on hazel. 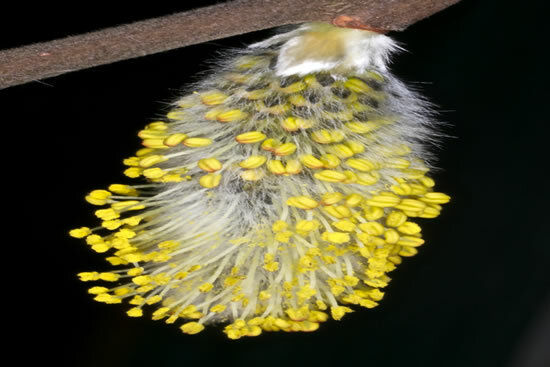 Slide 3 - Many flowering plants present their pollen open to insects for ease of collection, here we see the bright yellow anthers of a willow plant displaying the ripe pollen grains and a few anthers are still tightly closed with no accessible pollen. 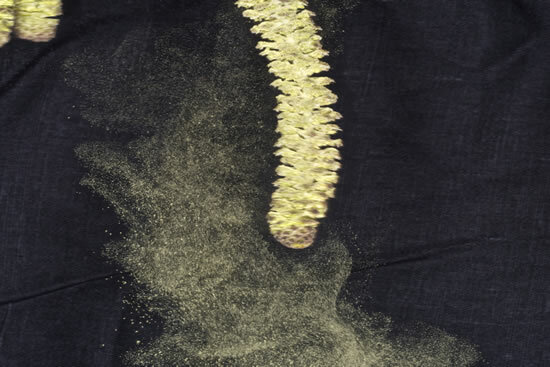 Plants stagger the availability of ripe pollen to aid the rate of success in pollinating other plants over a long flowering period. 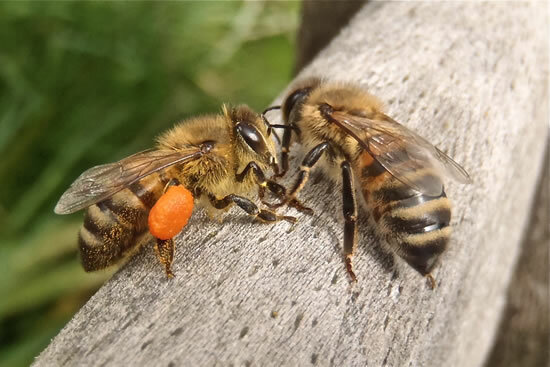 Slide 4 - Honeybees can sense and locate ripe pollen and visit flowering structures to collect the valuable pollen. 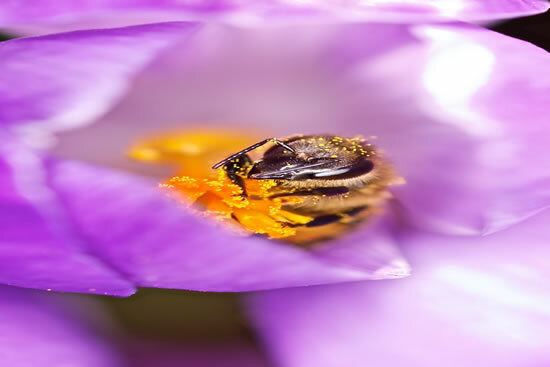 The structure of this crocus flower not only protects the ripe pollen, it also provides a refuge on a cold, late winters day, for the honeybee to pause and forage. Slide 5 - Flowers that produce an abundance of pollen from many florets, here a bee is visiting a sunflower, allow the bee to almost bathe amongst the pollen bearing anthers as the pollen sticks to the bees hairy body. 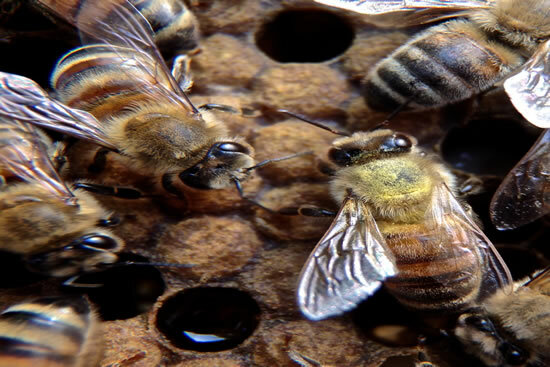 The honeybee has evolved specialist body parts and functions to help it collect and transport pollen. Slide 6 - Snowdrops are some of the first plants to emerge in the new year and because of the possibility of inclement weather the flowers hang downwards to protect the pollen bearing anthers, honeybees have learned the knack of collecting pollen and nectar from flowering plants such as these at a very important time of year. 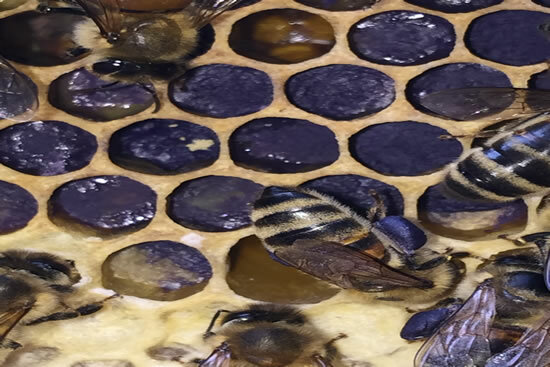 Slide 7 - The bee uses the brushes on its legs to comb its body and gather the pollen into special structures on its hind legs, you can see the rows of yellow banded brushes on its hind legs seen clearly on the left hand side. 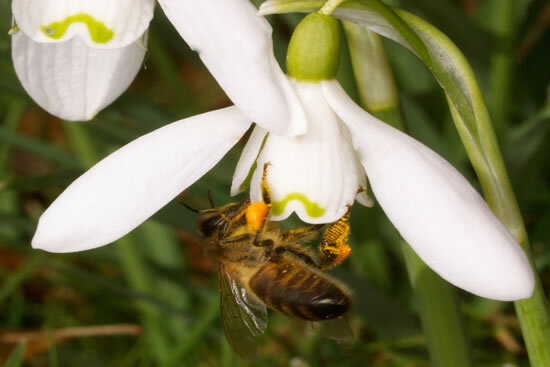 Slide 8 - Once combed together the pollen is moistened with an amount of nectar to allow it to stick together and It then sits firmly in the 'Corbicula' commonly referred to as the pollen baskets. 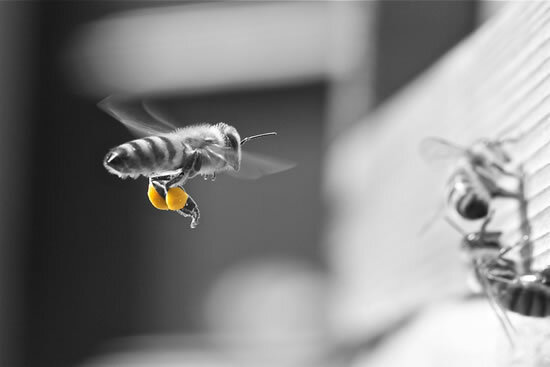 The pollen is usually carried in equal amounts each side to ensure a balanced flight profile, on approach to the hive the legs are lowered and the bee aims for the entrance. 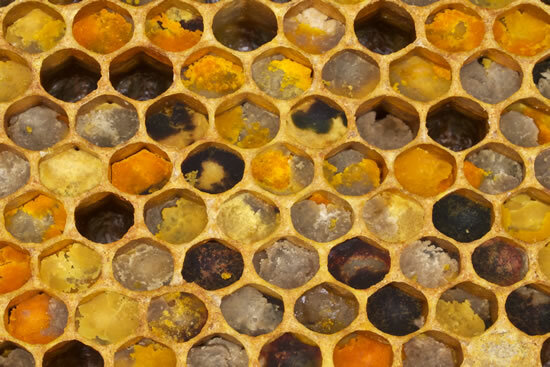 Slide 9 - On this photograph the pollen loads are highlighted in colour for ease of identification for none beekeepers. 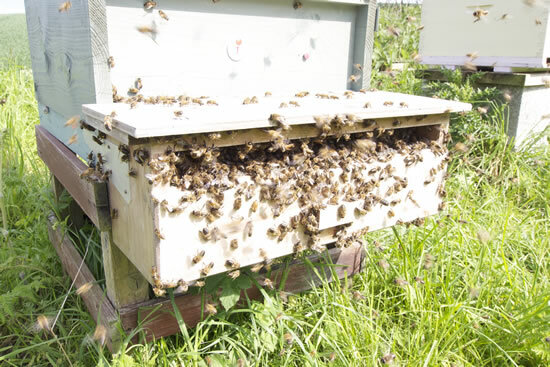 Slide 10 - Bees will collect pollen as and when the colony is in need and the pollen is available, as an excellent natural source of protein man also has a desire for pollen collected by the honeybee. 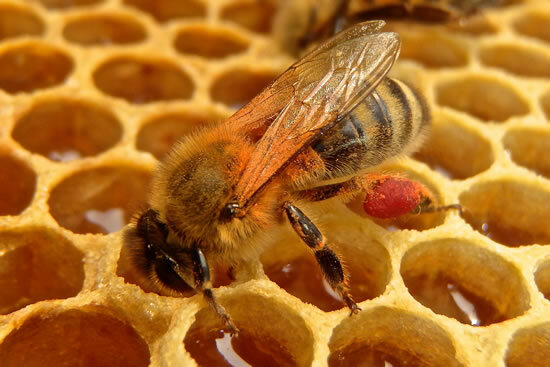 Here we can see a pollen trap that can be used to remove the pollen from bees as they enter the hive. Great care must be taken when using these devices so that the colony is not robbed of too much pollen. 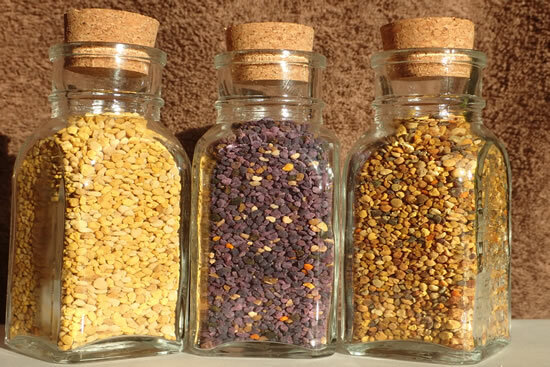 Pollen substitutes can be used to help alleviate a shortage of pollen or when a pollen trap is being used. 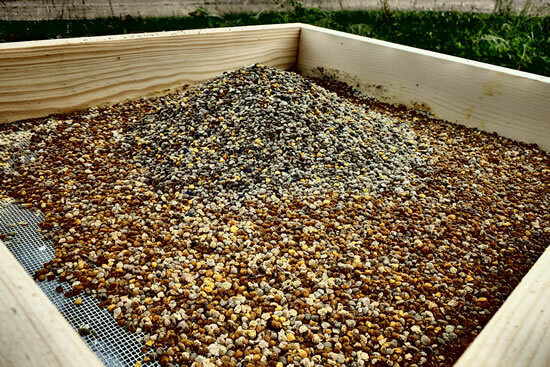 Slide 11- On a good day a large amount of pollen can be harvested for human consumption or to help feed back to the bees in times of dearth - here we see the contents of a pollen trap drawer and also the variety of pollen that the colony has collected. 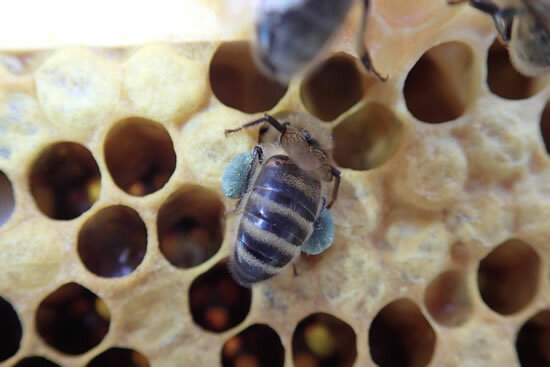 Slide 12 - Once inside the hive the bees remove the pollen from the corbicula and push and firm down the pollen into cells as close as possible to developing larvae. It is often thought that pollen is stored by type but here we can see pollen loads from different sources being stored together. 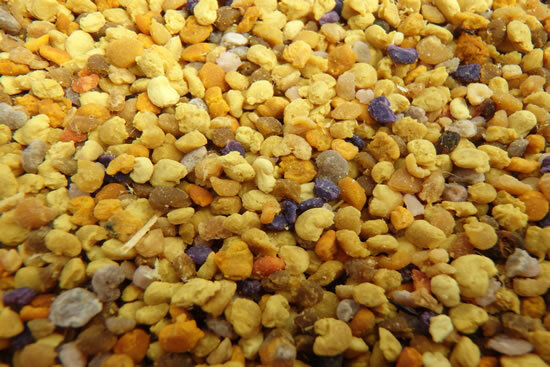 Slide 13 - This picture shows a great variety of different coloured pollen, indicating a wide variety of flowering plants that have been foraged from. This variety of pollen provides a varied diet to the honeybee and the developing brood, helping to promote health and vigour within a colony. Slide 14 - Here we see pollen stored adjacent to developing larvae (larvae at bottom right), a place where the pollen is needed the most as an essential food source. 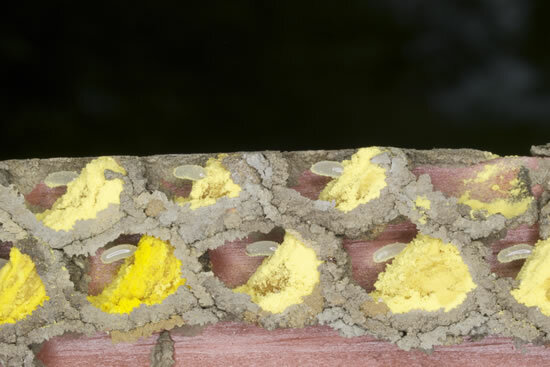 Slide 15 - Not only do honeybees collect and consume pollen - here we see egg chambers of a solitary bee but here the pollen is used as a food reserve for the larvae once it has emerged from the egg which has been laid on the surface of the pollen before the chamber was sealed. 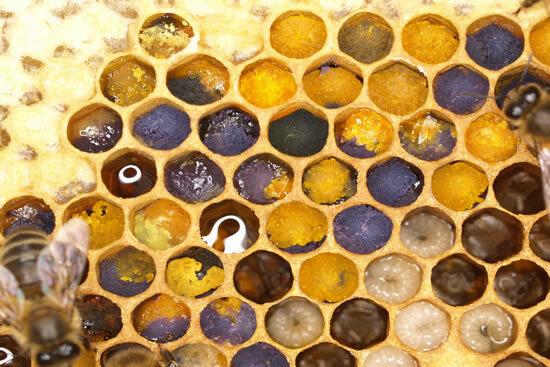 Slide 16 - Observations made of returning pollen foragers inside the hive can stimulate an interest in pollen sources with an array of colours being seen. Here a bee has a pollen load of an interesting but unknown origin. Slide 17 - For many of us orange and yellow are common colours of pollen but the colour range is far reaching. 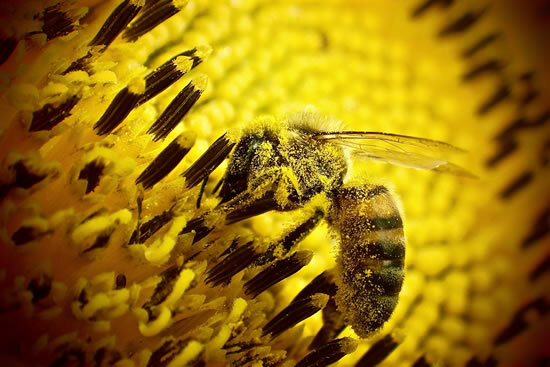 The loads of pollen that a bee can carry also varies. 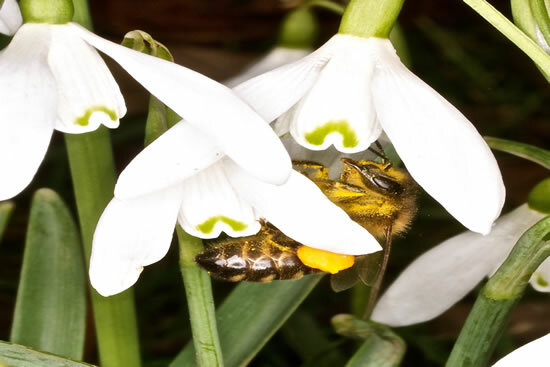 Slide 18 - Some flowers produce pollen that attaches itself to the upper surface of the bee and can be difficult to fully remove, evidence of the bees interaction with pollen loaded anthers is evident here, again inside the safety of the hive. Slide 19 - A returning bee is taking a well deserved intake of energy and this makes an ideal time to take a photograph and also study the pollen loads, here the bronze/crimson colour of pollen is possibly from horse chestnut flowers. Slide 20 - Late summer flowers of Phacelia produce a vivid purple/blue pollen that always attracts the eye of the beekeeper and is a favorite of the honeybee. Slide 22 - Singled out these pollen grains can be studies further to appreciate structures - here we see pollen from a species of pine tree. 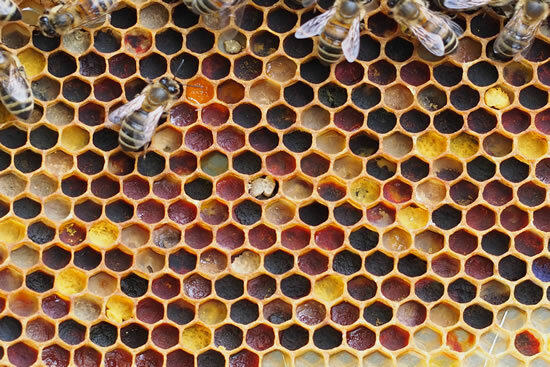 Slide 23 - Pollen is an excellent form of protein for honey bees but we can also enjoy it as part of our diet, here we see creamed honey with additional pollen. 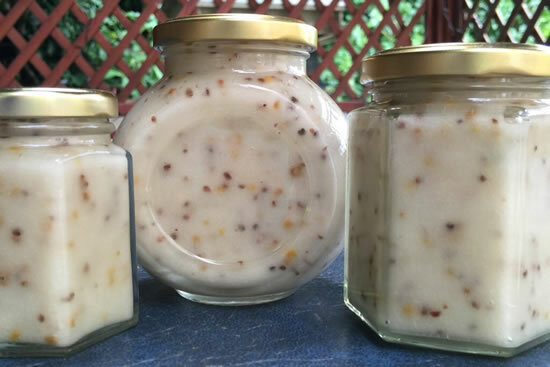 Slide 24 - Pollen can also be provided for human consumption in its entirety and looks very appealing in suitable clear containers.